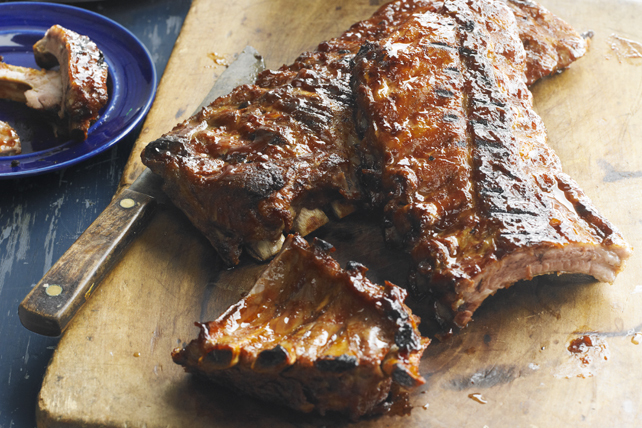 Make a "mess" of these sweet and sticky ribs with just a hint of heat for family and friends. Just be sure to have lots of napkins handy for two-fisted eating. Cook ribs and peppercorns in large saucepan of boiling water 45 min. Microwave jam in medium microwaveable bowl on HIGH 20 sec. or until melted. Stir in barbecue sauce and hot sauce. Drain ribs; place on barbecue grate. Brush with half the barbecue sauce mixture. Grill 15 min. or until ribs are done, turning and brushing occasionally with remaining barbecue sauce mixture. Brushing the hot ribs with the barbecue sauce mixture helps prevent them from drying out. Adjust the heat by adding more or less hot pepper sauce to your taste.